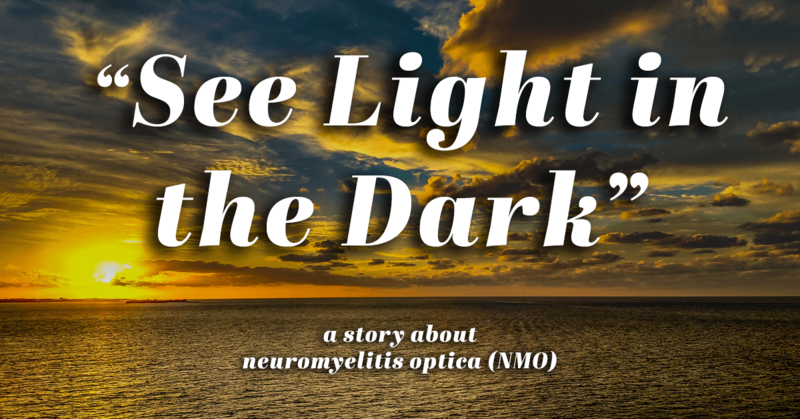 I am Verónica C. Herrera Vega and I want to tell you my TESTIMONY WITH OPTIC NEUROMIELITIS (NMO). I am 29 years old and I live in a small city in Valledupar, a small city in Colombia. Unfortunately, one-and-a-half years ago I was paralyzed from my neck to my feet in just four days. I’m not exaggerating when I write that I could only talk and hold my neck because of transverse myelitis (TM). My body literally didn´t respond. I felt trapped in my own being and my voice also began to dissipate. In the hospital bed, I looked at my hands and my legs, sending them signals to move even one millimeter, but they didn´t respond. It was terrifying. I went from being a healthy person who regularly exercised, followed a healthy diet, studied, and worked all at the same time, to becoming totally dependent on my parents. I had never suffered at all (except for one episode of a minor anxiety crisis when I was 20 years old, however, I was able to overcome that). September 26, 2016, marks the beginning of the terrible demyelination that left me quadriplegic in four days. It all started with a strong, terrible headache (I had never suffered from a migraine). From one moment to the next, I felt tingling in my left arm that did not stop. In the clinic, everything was uncertain. They thought it was cerebral ischemia, but it wasn’t. My body continued to become progressively paralyzed and in that moment I experienced a lot of strange symptoms (tight band on my torso, among others, which are difficult to explain). I just clung to God and hoped that the nightmare would end. Fortunately, I counted on my parents and the nurses at the clinic who gave me food and put on my diapers. They ended up inserting a permanent bladder into my body because I had stopped urinating. I found out later that Interferon can make NMO symptoms worse. By the grace of God, I walked again two months after the attack. I resumed my life. I am considered to be a miracle. I only had sensory and urinary sequelae. I don´t have a probe, but I have an overactive bladder. Three neurologists said that my diagnosis was Multiple Sclerosis (MS). In fact, the days following the attack I started taking Interferon but after the last doses, I started to suffer strange paralysis that made me writhe and stopped my breathing for 30 or 40 seconds. Finally, another neurologist attended me and he observed my resonances. He made me perform new examinations and I was diagnosed with a rare disease, little-known in the region called seronegative optic neuromyelitis spectrum disorder (NMOSD),” since my anti-aquaporin 4 antibodies are negative. I have lesions in my back at C2 and many in the brain including oligoclonal bands. I found out later that Interferon can make NMO symptoms worse. I was terrified to think that I had a wrong diagnosis. I never suffered from those twists or paralyzes. I live in a city of 500,000 inhabitants and there are only three people with this diagnosis, including myself. I have my theory about the disease: they say it happens to people with vitamin D deficiency, however, I live in a sunny city. In my case, there is no inheritance of autoimmune diseases, but I was always a perfectionist, which means that I stressed a lot over many things. I was in a stage of life where I wanted to do a thousand things at once and my brain said one day, “I arrived here.” For me, stress was the cause, along with the genetic predisposition that I may have from ancestors, I do not know. Fortunately, I have to say that I have a good neurologist who has given me treatment with a medicine called Rituximab. After fighting with the Colombian state, they are giving me this medication. I also buy vitamin D3 of 4,000 IU and take it daily. I follow a gluten-free diet. I resumed my job seven months after the attack. I work from Monday to Saturday during normal hours. Nowadays, I sometimes have pain in my neck, pain in the joints of the hands, occasional paresthesia (tingling) in the hands, but I am alive and this is the most important thing. My spirits are up. I never got depressed. God helped me out of this and gave me strength. I trust that I will never have an attack again. I want that same thing to happen to all the people who are going through this. I will be praying for everyone. Although the first words I read on Google about NMO read death at five years or fatal prognosis, today I have hope. I read the entire story of Ali Guthy and God had mercy on her. I know that with the help of the doctors (devoted to the fight) and other scientists we will find a cure for the NMO! I have the faith. Thank you very much for reading. God bless you! We are going to fight and find the cure for the NMO. I know about 10 more people have NMO in Columbia. I would love to be part of an essay or collaborate with the cause in some way. I titled my story “See Light in the Dark” because in the situation that I had to face, I always told myself that phrase. No matter how dark the panorama looked, I had to see light in the dark. TO THOSE WHO PASS FOR THE SAME I SAY: SEE LIGHT IN DARKNESS AND HAVE CONFIDENCE IN GOD THAT EVERYTHING CAN. HE HELPED ME TOGETHER WITH THE ADVANCES OF MEDICINE. NEVER GIVE UP, GO AHEAD, FAITH MOVES MOUNTAINS, MAKE POSSIBLE THE IMPOSSIBLE!